This past weekend a couple of buddies and I decided to "hike" the Kentucky Bourbon Trail. It was a great experience. Everyone knows that Kentucky is the home to the all American drink called bourbon. There is a common misconception among bourbon drinkers that bourbon must be made in Kentucky. It turns out that is not true. While well over 90% of bourbon is made in Kentucky and the name bourbon does come from Bourbon County, KY, bourbon can be made anywhere in the United States. There are some strict requirements one must follow to call their spirit a bourbon. But, it doesn't have to be made in Kentucky. 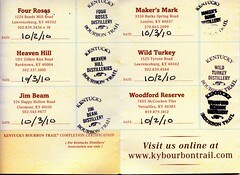 The Kentucky Bourbon Trail is a group of six distilleries in Kentucky. They are all within 60 miles of each other. The trail will take you at least two days to do due to the limited hours of operations of each of the distilleries. Tours will take from 30 minutes to an hour and a half at each. After the first two, a lot of the information does become redundant. But, each distillery is different enough to make it worth the visit. Plus, you get to have a little taste at the end of each tour. Each distillery has a guided tour and a gift shop where you can buy all kinds of souvenirs from your trip. Pick up a passport at your first stop and get it stamped along the way. If you can collect all six stamps, you can send it in for a free t-shirt. We stayed at an historic bed and breakfast in Bardstown, KY- the Veranda. We visited The Old Talbott Tavern for a beer. We also had some down-home cooking at Kurtz Restaurant while we were there. Woodford Reserve- Woodford Reserve was one of my favorite operations. I plan to go there and to Maker's Mark again. Woodford Reserve makes only one product. It's a small batch, hand crafted bourbon. Their copper stills are unique and made in Scotland. There are several limestone buildings on the property. The place was surprisingly small to me. If my calculations are correct, based on the number of barrel houses they have and the size of each one, they are about 1/700th the size of Jim Beam. You get a real sense of the history of bourbon making at Woodford Reserve. I don't drink Woodford Reserve often. I hadn't had it in a couple of years. It was better than I remembered. If I remember correctly, it was the only bourbon we saw that is triple distilled. One thing though. Both Maker's Mark and Woodford which were the only places we visited that don't produce a slew of bourbons are part of larger organizations now. That was a bit disappointing to learn when you hear about the centuries of tradition behind them. But, both still do things much the way they did back when they were independent. Wild Turkey- Wild Turkey dwarfs Woodford Reserve both in size and in scope. Wild Turkey makes several varieties of bourbon, including a honey-flavored bourbon liqueur. Wild Turkey had a much more industrial feel than Woodford Reserve. The guide told us that the bourbon market is way, way up over the past couple of years. So much so that Wild Turkey is moving from their current location (their second) up the road to their third location. The plant was shut down while we were there. But, the new place should be up and running by the end of October 2010. I tasted their bourbon that uses more rye than normal, which was very interesting because, it almost tasted like scotch. I also tasted their Rare Breed Barrel Proof bourbon. Whoa, nelly! There's a reason they add a little water after they take the bourbon out of the barrel. Not my favorite. While we were at Wild Turkey, the tour guide mentioned they sell some of their barrels to scotch producers. Since bourbon can only be made in new barrels, all of the producers sell their barrels off to scotch producers. But, in true Kentucky hospitality form, he told us about a beer called Kentucky Bourbon Barrel Ale that is actually aged a little while in one of their used barrels. Of course, we had to try it that night at Talbott Tavern. It was an interesting cross between a bourbon and a beer. Beer flavor and feel with a bourbon-like aroma. Four Roses- Four Roses is a bourbon I wasn't familiar with at all, except for the name. The distillery was interesting as the buildings have a Spanish architecture, completely unique for the bourbon distilleries in the area. Four Roses produces several different bourbons. Most of the distilleries produce small batch bourbons and single barrel bourbons in addition to their standards. But, what was really wild is they produce 10 different bourbons that they blend into their "standard" bourbon. I was pleasantly surprised both by the taste of Four Roses and the price (less than $20 near me). The other tastings we had at Four Roses were good. But, I think I actually liked their cheapest bourbon best. Heaven Hill- I remember Heaven Hill from my college days. Heaven Hill is rock gut stuff. I was not looking forward to the tasting there. But, if you're thinking of skipping Heaven Hill, don't. Heaven Hill actually produces several bourbons, a couple of which are very good (Evan Williams and Elijah Craig). They also have the nicest visitor's center of any of the places we visited (with the possible exception of Maker's Mark). We didn't have time to do the tour there. But, the woman working there was kind enough to offer us a tasting anyway. We had the barrel shaped tasting room all to ourselves at noon on that Sunday. We even got to taste a 23 year old bottle that is only sold at the visitor's center and in Japan (at $350 a pop!). Maker's Mark- Maker's Mark is my bourbon of choice. When I moved to Kentucky 24 years ago, I was introduced to drinking bourbon straight and to Maker's Mark. To this day, it is the smoothest bourbon I've ever had and I've had some pretty "premium" bourbons. I am an ambassador for Maker's Mark. My name is on a barrel in one of those barrel houses in Loretto, KY. I was really looking forward to this tour more than any other. The secret to Maker's Mark is most bourbon makers use corn (50-80%), rye and malted barley. The Samuels family had been making bourbon for about four generations before the founder of what would become Maker's Mark decided he didn't like their bourbon and literally burned the recipe. Instead of using rye, Maker's uses red winter wheat which makes it softer and slightly more sweet. Up until a couple of months ago (July 2010), Maker's only made one bourbon- this premium, hand-crafted, hand-dipped bottle smooth sipping' bourbon. Recently, they added Maker's 46 to the line-up, taking the exact same bourbon and adding charrred French oak stays to the barrel for a few months to give it an even smoother and slightly smoky flavor. Jim Beam- We hit Jim Beam at exactly 3:58 Sunday afternoon. The reason I know this is Jim Beam's closes at 4:00 on Sundays. We wanted to get our last stamp so that we could collect our tee-shirts. There are no tastings at Jim Beam's on Sunday. So, getting the stamp completed our mission for the weekend.